SAL DeTRAGLIA'S VIRTUAL TAPAS BAR: I’M BAAAACK. I’ve just returned from two weeks’ vacation. Sorry for not providing advance notice, but—given that I’ve long-since disclosed my true name and home-town—it didn’t seem prudent to tell the Internet’s three zillion users that the material possessions in my vacant house would be available for an unobstructed fourteen day harvest. But this wasn’t a mere upgrade to Business Class. No, no, no. Those bloody fools sent us all the way to First Class. First Class, dammit! That’s something I *never* thought I’d experience, because (amongst other reasons) I’m a first-class cheapskate. My daughter, in particular, appreciated the experience. 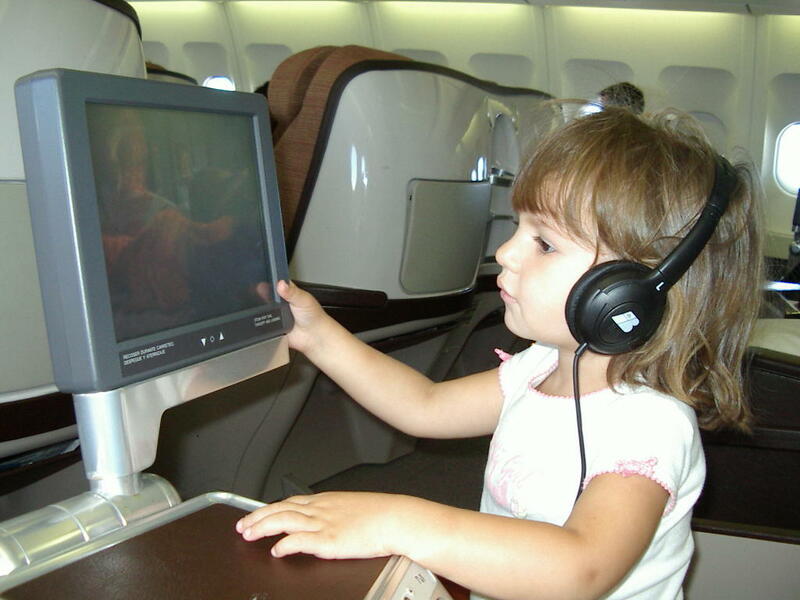 The photo above—which I’d be pleased to license to Iberia Airlines for a mutually-agreeable royalty—shows her enjoying an episode of Sesame Street at forty thousand feet on her own private video monitor. But her favorite perq was that little button that reclined her ample, well-cushioned seat into a fully-horizontal bed…thirty or forty times within a span of nine-hours. My apologies to the infinitely patient woman sitting across the aisle. A nomination for her beatification has been sent to Pope Benedict in this morning’s post. If there was a downside to receiving this upgrade, however, it was that we *didn’t* get one during the trip back to Spain. Of course, I didn’t expect that we would. Lightning rarely strikes twice in these matters. But try explaining that to a three year old. Especially one who believes that airplanes can’t fly until all passengers have been given a glass of champagne and a steamed linen washcloth. Nice. I'm taking our eldest back in October. I'm sure we won't be upgraded though. I learned on this trip that the horrors of coach are mainly limited to adults. Kids don't seem to mind. My daughter slept twice as long (four hours) on the trip back, than she did in the luxurous trip there. I suppose that even a coach seat seems enormous to a three year old. It also helped that I brought a portable DVD player. We didn't need it in First Class, but we watched entire Winnie the Pooh and Teletubbies DVD's on the trip back. At one point, a passenger on his way to the restroom noticed my daughter engrossed in Teletubbies and said, "She seems really absorbed." I responded, "Yeah...she's the happiest person this side of business class." I'll never travel without a DVD player again. You're back! Great! You did actually leave a little hint in my comments before you left so I knew where you'd run off to, but I didn't spill the beans. First class - well aren't we fancy. :-) Cute picture of Inés - what a little lady. So did you visit family? And more importantly, did you arrange anything with Weber? Hey Franje: You were correct in your assumption. Vacations can be hard work. Hey Christina: I didn't eat any pancakes, but I did snarf down a few Belgian waffles. How that's close enough. BTW...I'm happy to see that the new "Word Verification" step hasn't posed problems for you commenters. Blogger just added this feature. It is intended to thwart spam comments. So far, so good. If an Blogger users want to activate it in the blogs, just go to the Dashboard and click on the Comments tab. Scroll down a bit and you'll see the icon to activate it.